It’s a really fun hobby that stretches from child to adult options. This means you can grow and connect with your kids as they grow and get more invested in it. Model trains are also great for early development and bonding at home. But with so many different options on the market, where do you even start? Well, here’s our top 5 picks that would be safe for any child to play with. Make sure to have a read through because some are amazing for 3-year-olds and other 10. We’ve really tried to include the best of the best while retaining a diverse mix! What’s more iconic than Thomas the Tank Engine? Probably not much else when it comes to kids trains. This is the perfect gift and our number one choice for a variety of reasons. It’s a Bachmann product firstly; they’re a mainstay in the industry and have been producing high-end model trains forever. It runs at HO scale, the most popular size so it’s easy to add to later on. And lastly, it’s a really fun product that works well as a stand-alone gift or an introduction to a lifelong hobby. A few people have mentioned that sometimes the train will have trouble staying on the tracks, and that’s more of an issue with making sure they’re placed together correctly. It’s not as easy as slotting them together like a jigsaw, so just make sure you take your time when setting it up. 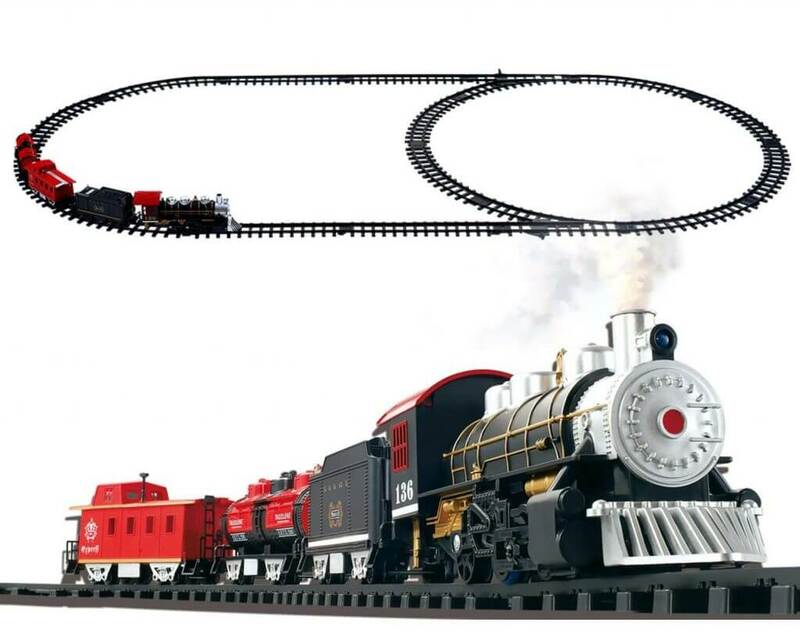 This WowToyz train set is a little bit different from the others on the list. It’s markedly cheaper than anything else, and the quality is going to match it. So why even put it in the list then? Well, Not every train needs to be lots of dollars, especially when buying for younger kids. A train like this is the perfect way to get them interested in a model train hobby, or even just as something to play with for a few months before moving onto the next thing. This is more than enough for any kid to spend hours playing and building different train layouts. The best part about the track is that it’s a softer plastic and there are 25 feet of the stuff! This means it takes way more abuse and won’t break as easily, plus allows for a ton of different layout options. No kid is going to be bored with this thing. The Lionel Polar Express train is a must have for any kid, especially around Christmas time. 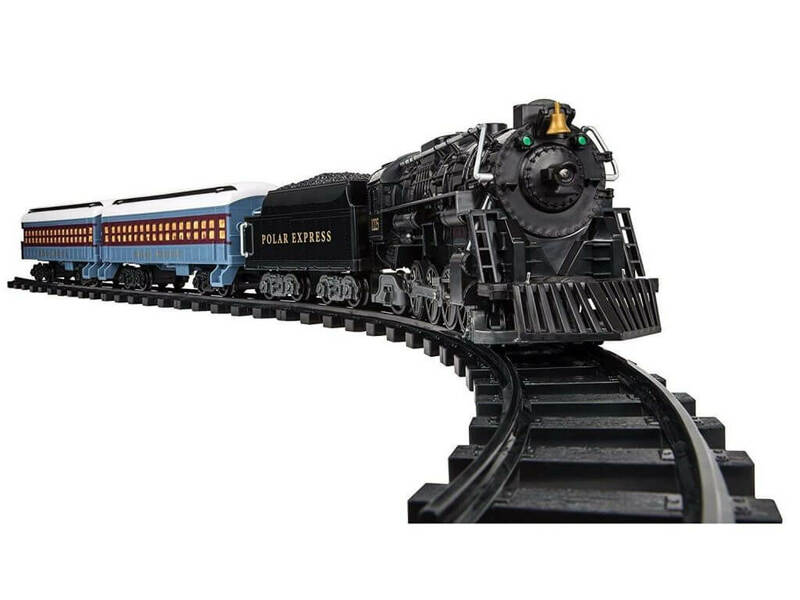 Lionel trains are industry leaders when it comes to model trains, and make a wide variety in different model train scales. They’re well known for two things; high-quality models that stand the test of time, and their themed trains, including their Polar Express set. They do a variety of different priced Polar Express ones, but this is a moderately priced one that’s suitable for children. working headlight and 2 passenger cars and a coal car. Can’t stress enough how well manufactured Lionel trains are, so this is definitely something that your child could keep and cherish for a long time. 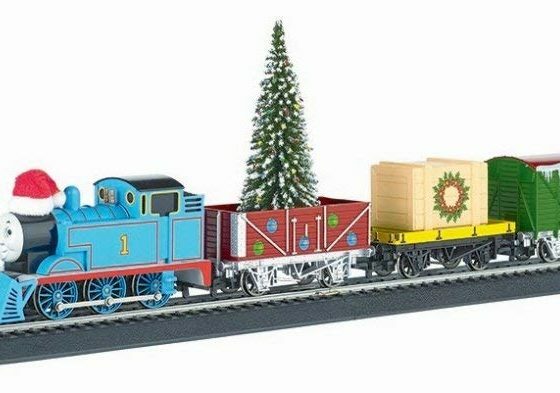 The best part about a train like this is bar the words “polar express” on the side, it looks like a normal train and will translate well onto other tracks! We’ve added a second Lionel Train just because they’re so good. This one is a pretty stock standard “normal” looking train too, so it sort of skews a little older, age wise. 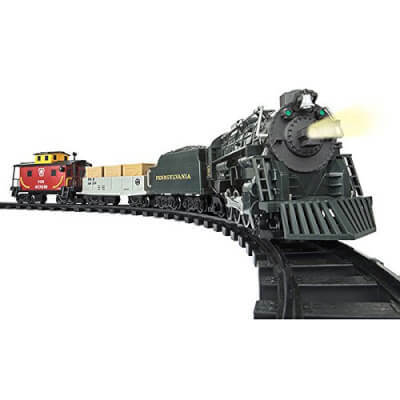 This is a bigger train and runs at G scale, so it’s something that kids are going to be able to hold and look over, and won’t manage to lose any pieces either! This is definitely one of the bigger train sets in this list, so it’s worth considering if you only have a tiny apartment. 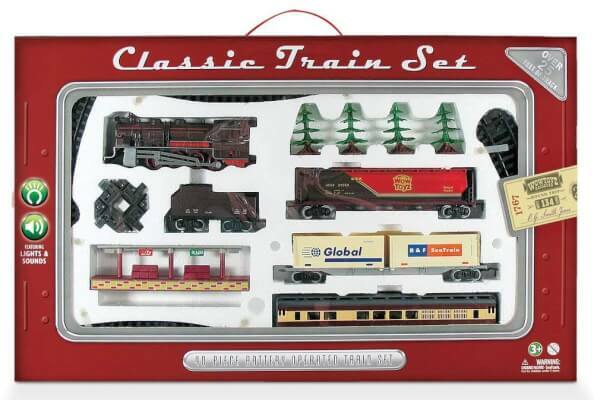 G scale is normally an outdoors or under the Christmas tree kind of train because you want them on display. Poco Divo is a manufacturer of kids toys, and they do it well. This model train set comes complete with smoke, lights, and a ton of track and cars to keep any kid entertained for hours to come. It’s at a really reasonable price-point for still being a pretty high-quality item. So what’s the drawback? Well, it doesn’t fit on a regular scale track so it’s really a one-off purchase. You won’t be able to fit it on an HO scale or O scale like you would the Lionel or Bachmann train sets. If you go in with that in mind and are just after a one-off train track for a small child, this is a really good one to look at. A few people complain about the smell of the smoke because it’s a cheap paraffin wax. It’s a totally safe product, but if you’re not a fan of the smell, it’s a cheap product at your nearest $2 store. When considering buying a model train set for kids, there are a few different things you should take into account. Firstly, what kind of train do you want to buy them and how much space do you have? If they’re a 4-year old kid in a tiny apartment, something like the WowToyz train is a good option, but for a 10-year-old with a bit of space, the Lionel Pennsylvania Flyer in G scale would be a better option. Also, work out if this is just a toy or something you think they’re going to be into for some time to come. If they will be, consider buying a train set that will run on an industry standard scale and gauges like HO or G. This means they can add to it as they get older, and will hopefully keep and cherish this gift for years to come. Next, it’s mostly a matter of working out what kind of train you think they’ll like. These 5 are our top picks, but there are hundreds of both good and bad trains out there to buy. So make sure you do some proper research on the best model brands before buying, so you end up with a quality train that any kid will love! If you’re new to hobby model train scales, you should have a read of our Ultimate Guide to Model Trains to really get a feel for the hobby. Got a different suggestion for us, we’d love to hear about it in the comments below!